Named for its resemblance to the eye color of a magnificent big cat, tiger eye is a kind of chalcedony, which is made of thin layers of multicolored quartz. Tiger’s eye is formed when a type of blue asbestos called crocidolite is replaced by quartz fibers. The asbestos breaks down and leaves a residue of brown iron oxide that gives the tiger eye its color, while the lines of quartz fibers allow for the sought-after lines of light in the jewel. The replacement of crocidolite with quartz also makes tiger eye a pseudomorph, which happens when a mineral gradually replaces another mineral. It’s not surprising that tiger eye is often found in metamorphic rock, which changes from one rock to another over many millennia. Gemologists believe that tiger eye was worn as early as 2000 years ago by Roman soldiers. The gem was supposed to fortify them before they went into battle. Tiger’s eye was officially “discovered” in the early 19th Century in South Africa, but it took until the latter part of the century for mineralogists to devise a theory as to how it was formed. The theory that the gem is created out of asbestos is still popular, but a newer theory suggests that it is just another form of crocidolite. Tiger’s eye is prized for its chatoyancy, or cat’s eye effect. This looks like a streak of light that seems to hover either just below or just above the surface of the gem. It also has a unique, silky luster. 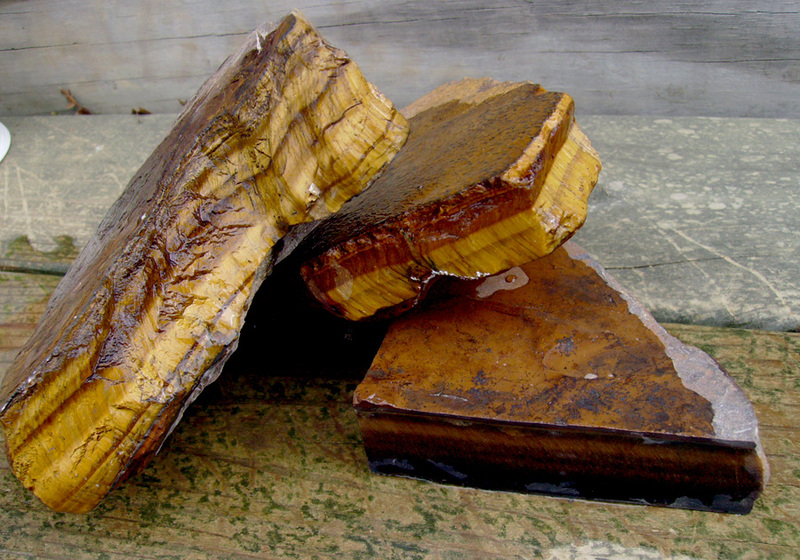 Tiger’s eye can also form with limonite or hematite to give the gem interesting patterns of red-brown, gray or yellow. The chemical formula of tiger eye is SiO2, which means it’s made almost entirely of quartz. It has a hardness of 7 on the Mohs hardness scale, which allows it to be tumbled without being damaged. Since it is quartz, it’s also tough enough to be carved fairly easily. Lapidists cut tiger eyes as domed cabochons to highlight the play of light within the gem. The tiger eye is a type of polycrystalline quartz, which means it features many hexagonal crystals. It has a refractive index of 1.53 to 1.56 and a specific gravity of 2.63 to 2.65. Tiger eye is opaque, which means light does not pass through it. It has an indiscernible cleavage, which means there is no point where it splits neatly. However, some gemologists claim that tiger eye has a very good cleavage. It can fracture when exposing it to sudden changes in heat. Consequently, the red versions of tiger eye are heated gently to improve their appearance. Though tiger eye is an inexpensive gem, the gem cutter must be quite skillful to cut and polish it in a way that brings out its chatoyancy and its silky luster. It is rarely faceted and has such a singular look that it’s hard to mistake it for any other gemstone. Tiger eye is a protector against the evil eye for centuries. It joins the energy of the earth with the energy of the sun so the user can enter a state that’s both highly vibrational yet draws on spiritual energies from the earth. When tiger eye is placed on a person’s third eye, it facilitates their psychic abilities. It also balances the lower chakras. Tiger eye also brings out integrity. It helps people accomplish their goals, find their inner resources and clarifies their intentions. When it is placed on the navel chakra, tiger eye helps people who tend to be vague or uncertain. The gemstone is good for helping the user recognize both their needs and other people’s needs. It shows the difference between what a person wants and what they really need. Mentally, tiger eye helps the hemispheres of the brain work together and sharpens perception. It helps a person integrate scattered information to create a coherent unity. It may solve internal problems that are caused by pride and stubbornness. The gem is useful for mental and personality disorders. It improves a person’s self-worth, quiets their self-criticism, elevates the mood and allows for the free flow of creativity. It balances the yin and yang energies. Gold tiger eye helps a person attend to detail and banish complacency. It helps a person take action from a logical rather than emotional stance, and fortifies students during tests and workers who face important meetings. Red tiger eye vanquishes sluggishness and slow metabolism and gives a person motivation to heal. 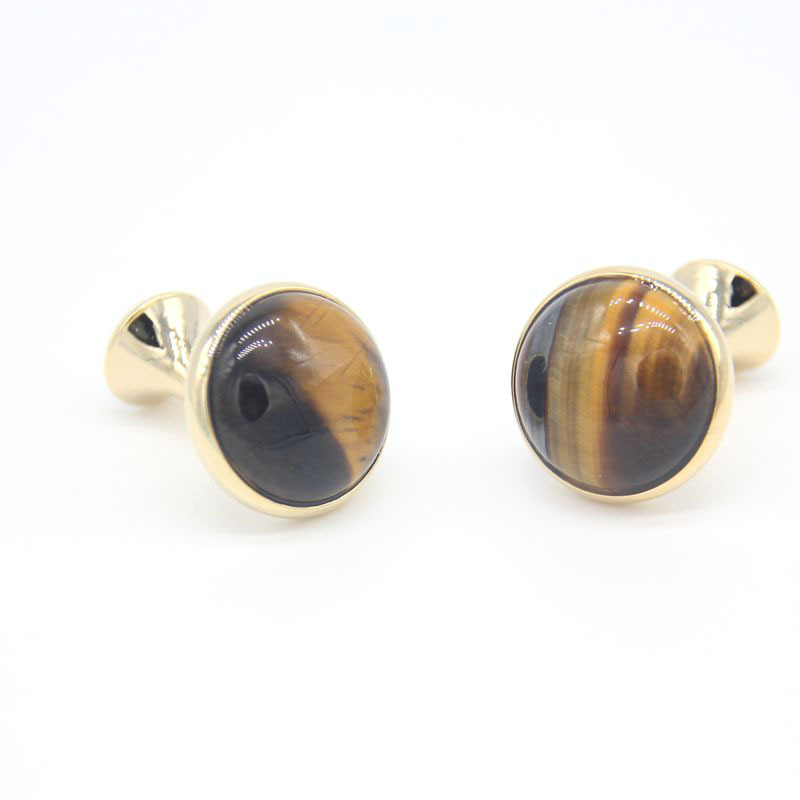 Tiger eye treats problems of the eye and heals fractured bones. The gem helps night vision and resolves problems with the throat and reproductive organs. It is best to wear it on the right arm or as a pendant, but don’t do it for long periods. One should also place it on the area of the body that needs healing. Truly famous examples of jewelry that use tiger eye are hard to come by, but tiger eye stones are so inexpensive and plentiful that they are quite popular in costume jewelry and jewelry for everyday wear. They are especially favored for men’s rings and cufflinks. They also make charming rings for women as well as earrings, bracelets, and pendants. Jewelry designers who use cat’s eye include Avanti, Van Cleef & Arpels, Lux, and Falcon Jewelry. We find most quality tiger eye in the Northern Cape Province of South Africa. Other good specimens are available in Thailand, Australia, Namibia, India, the United States, Canada, and Burma. This beautiful gem with its silky, fine looks and dancing light has been prized by humans for thousands of years, both as jewelry and as a talisman. Fortunately, it is very available and affordable and those interested can purchase it from jewelry stores, the jewelry counters of department stores and on the internet. Hey Buddy!, I found this information for you: "The Tiger Eye Gem and the Radiance of Its Strong Orange Hue". Here is the website link: https://accessgems.com/tiger-eye-gem/. Thank you.